Samuel P. Taylor State Park, cool, shaded, and OPEN! The budget mess is colluding with red flag warnings, resulting in confusion. Where should you go hiking this weekend? This windy morning the streets of San Francisco are littered with pine needles, leaves, and small branches. High winds combined with dry conditions can easily lead to serious fire danger. I would recommend staying clear of parks in the red flag area. Tomales Bay State Park is open! It's a little bit of Point Reyes without the budget closures, since Tomales Bay is a California State Park. Samuel P. Taylor State Park is open! This gorgeous destination, with grassland, shaded woods, and ocean views, is just a few miles from Point Reyes. Angel Island instead of Alcatraz. Better hiking anyway. Kortum Trail, on the Sonoma Coast, offers sweet coastal views. 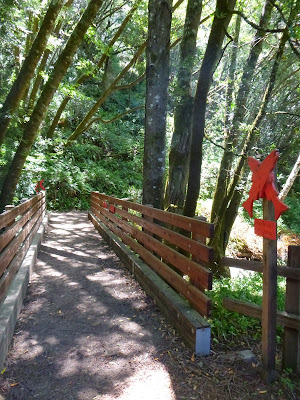 Armstrong Redwoods is a suitable wine country substitute for Muir Woods. Lower elevation Mount Tamalpais hikes such as Phoenix Lake and Sky Oaks are safer than higher elevation destinations. Huddart, Wunderlich, Edgewood, Pulgas, Coal Mine Ridge, Fremont Older, Picchetti Ranch are safer Peninsula options. Be sure to check trail conditions with the managing agency before you head out -- stay safe! How about Lands End? Is that still open? I heard their faciiities were shut down, like the Lands End Lookout and their restroom facilities. Marin County Open Space District (as opposed to MMWD)?